Hey Sweetie! Yes, you. I’m speaking to you. 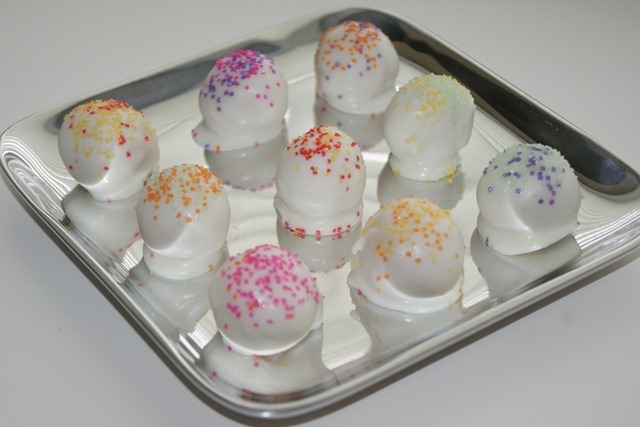 Proudly serving, Sugar Cookie Truffles! I love those soft sugar cookies you buy at the store in a plastic container that have fluffy frosting on them. I can eat a whole container of them if I’m left alone. 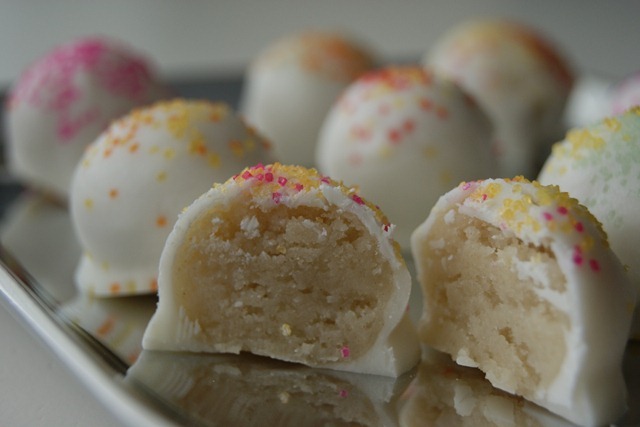 So no wonder I absolutely adore these truffles made from baked sugar cookies! 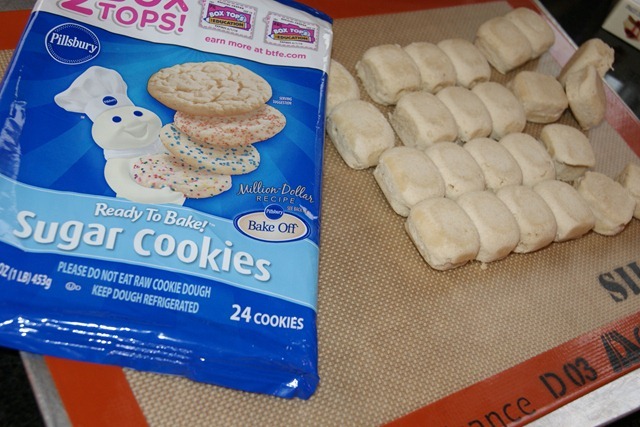 Plus, they are super duper easy to make since you used refrigerated sugar cookie dough! Bake sugar cookies as instructed on the package. 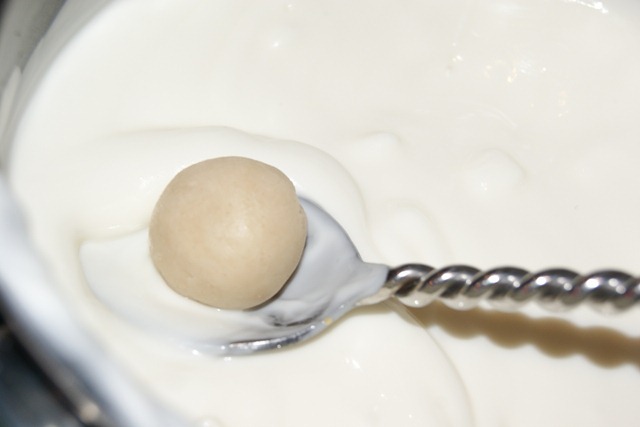 Stir in cream cheese and form in to small balls. 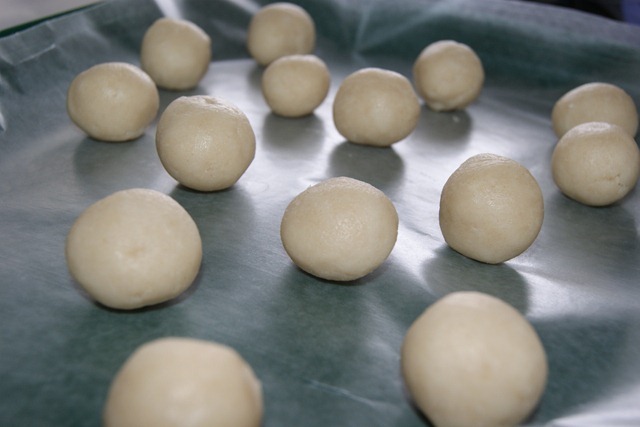 Roll the balls out in your hands until smooth and place on waxed paper lined baking sheet. 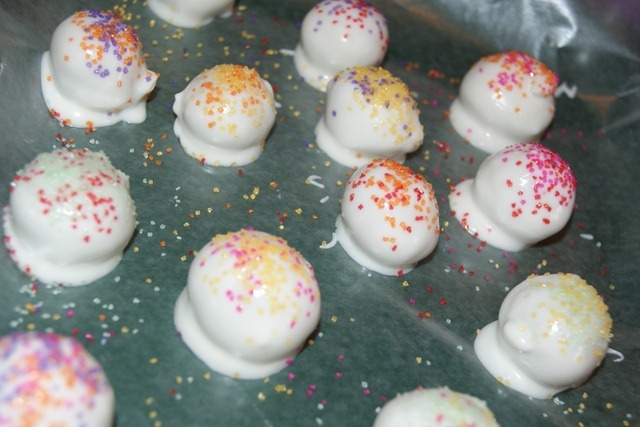 Melt the white chocolate coating and then dip the balls to coat fully. 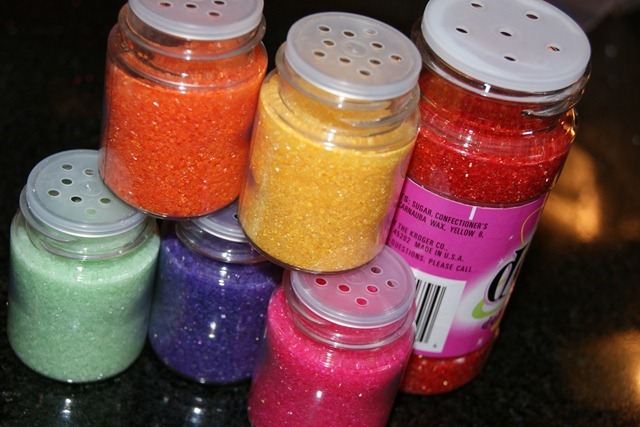 Sprinkle with colorful decorations. 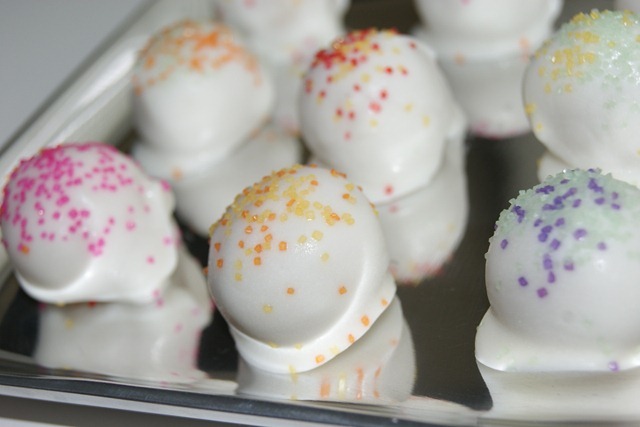 White chocolate for melting and dipping. Bake sugar cookies as instructed on the package. Cool cookies completely. 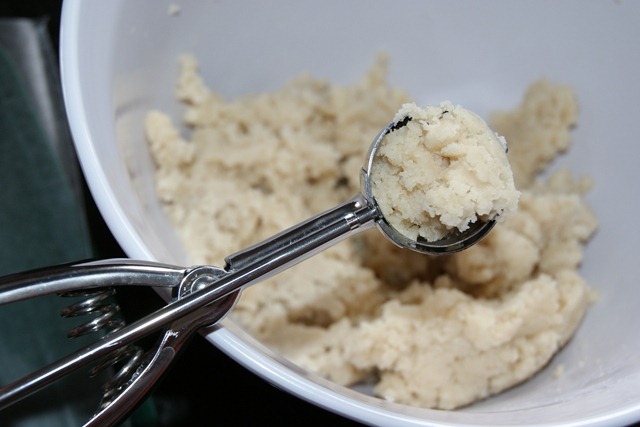 Place cookies in a food processor and pulse until cookies are all crumbled up. 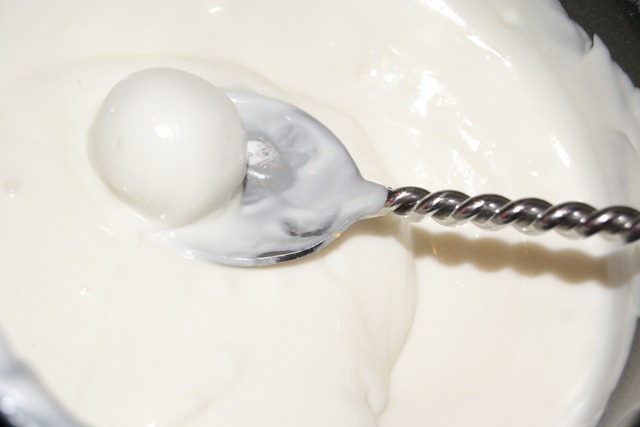 Add in cream cheese and thoroughly mix. Chill dough in refrigerator for 30 min. 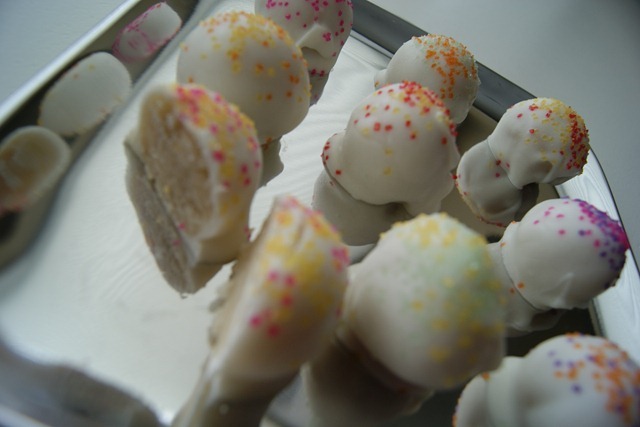 Form small balls with cookie scoop and roll around in your hands to fully form a smooth ball. Place on waxed paper lined baking sheet. Refrigerate sheet of balls for 30 min. 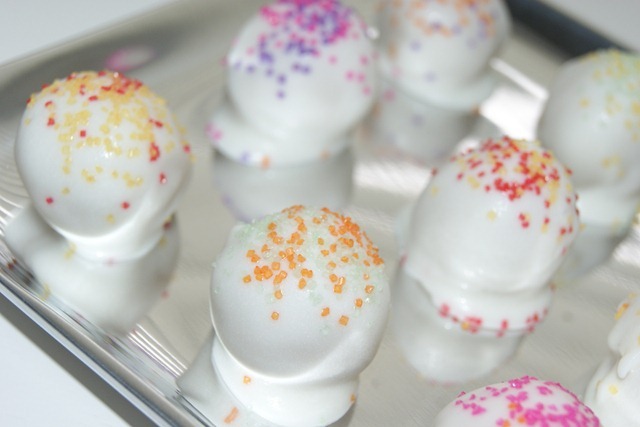 Melt white chocolate. (I used the stovetop). 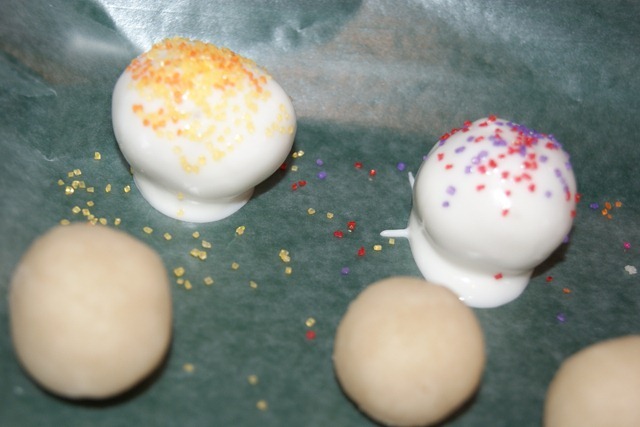 Dip each ball in white chocolate, coating fully and place back on wax paper lined sheet. 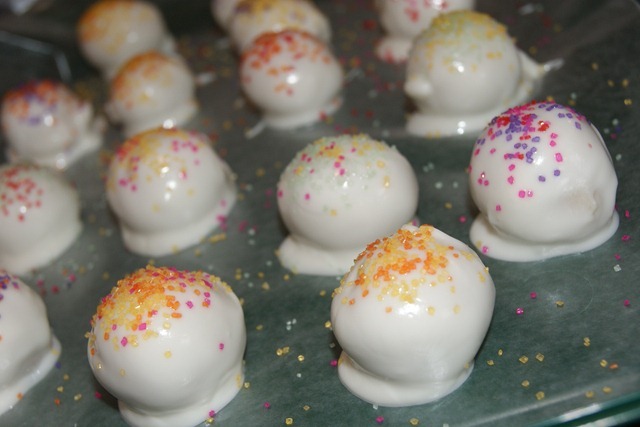 Sprinkle on the decorations after each one, before the chocolate hardens. Allow to harden and then serve. Enjoy! Store in refrigerator. Sweet and rick sugar cookie goodness! Don’t you wanna take a bite or two, three, out of that!!! Such a soft and creamy center! And I’ve got a tray full to share with all my co-workers. Aren’t they the lucky ones?! Ha! They look like a bunch of Easter eggs! That’s right. 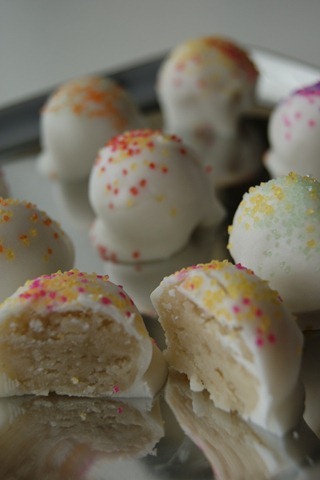 Sugar Cookie Truffles, YUM! Yum is an understatement. 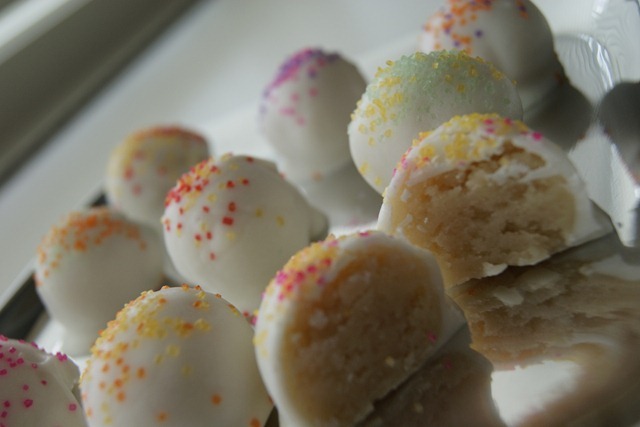 Are you a sugar cookie lover? Do you prefer yours baked soft or hard? 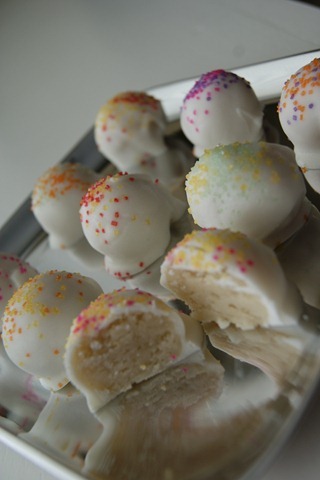 This entry was posted in Deliciousness and tagged Dessert, Sugar cookie, Truffle. Bookmark the permalink. Soooo yesterday I told my mom that this is the dessert that I’m bringing to a baby shower…and then you posted this today! Craziness! Oh good Kristen. Are you making them baby pink or blue? These look delicious!! I love sugar cookies baked soft & hard; just depends on how I feel ;). Um…and I thought oreo truffles were my favorite truffle in the world. I have a strong feeling THESE will take 1st place! I am so making these. My favorite cookie in the whole world is sugar! I like the super soft, thick kind with so much frosting that it makes *normal* people feel sick (but not me…..there is so such thing as too much frosting to me). I agree, I love all the frosting. These are super easy and a bite sized delicacy! Oh my god. I will be making these very soon. Shanna, I love those too. My husband brings them home from the store ocassionally and I devour them. Those truffles look delicious!!! 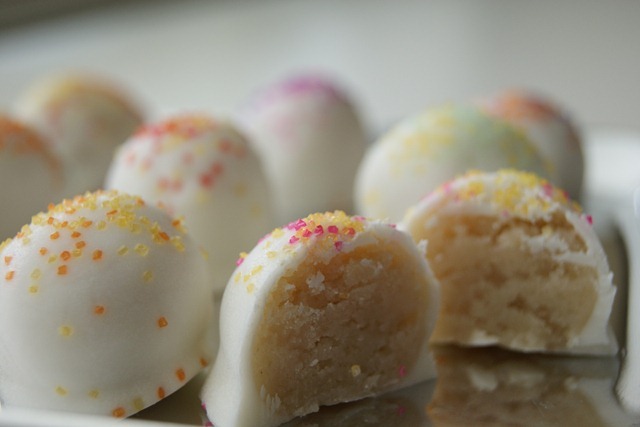 I love sugar cookie dough, and these are so perfect for easter! 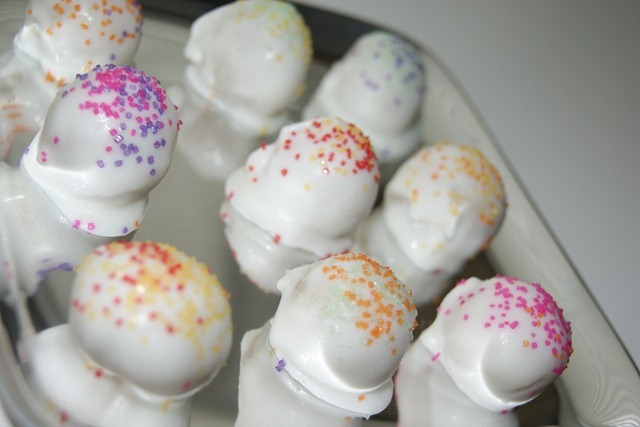 Yep, they do look like lil Easter eggs decorated like this! I think everyone knows how much I love bright colors! They are bite size bundles of joy! Those look delicious! 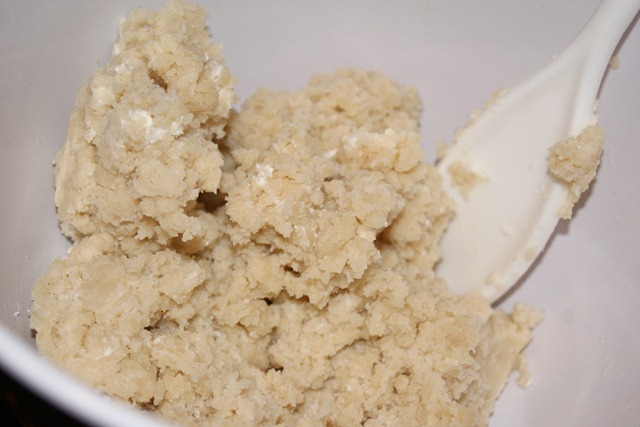 I’m more of a soft/chewy cookie girl-thanks for sharing this recipe! Well, they can take the colors from your wardrobe but at least they can’t take the colors away from your baking–these look great! I don’t hate sugar cookies but they arent my favorite. But then again, if you put one in front of me, I wouldn’t not eat it! Hot Damn! These look so good! 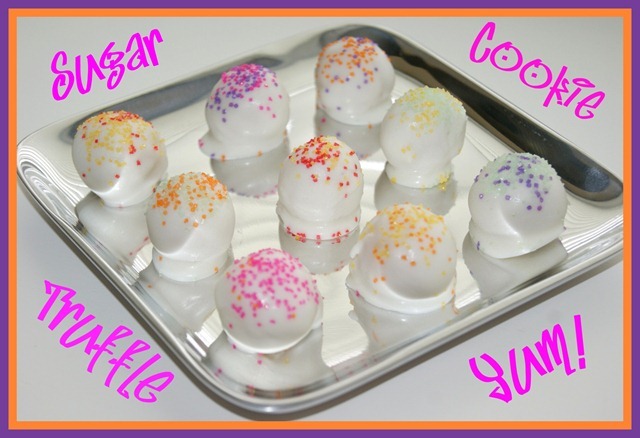 Just like oreo cookie balls only sugar cookies?! OMG yes yes yes! I seriously can’t wait to try these out-you are a genius my friend! These look so delicious! 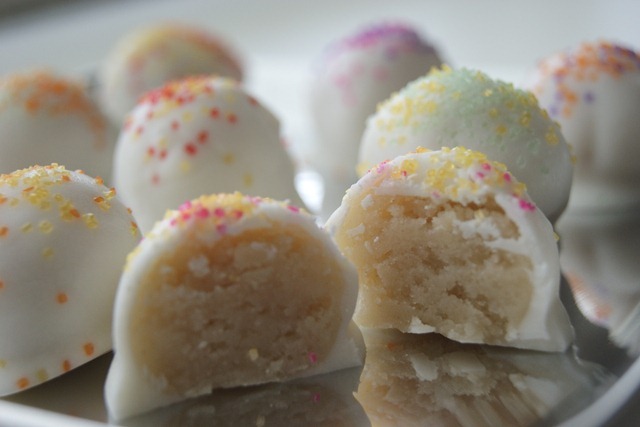 I’ve made cake pops before but never sugar cookie truffles. I’ll definitely have to try these! 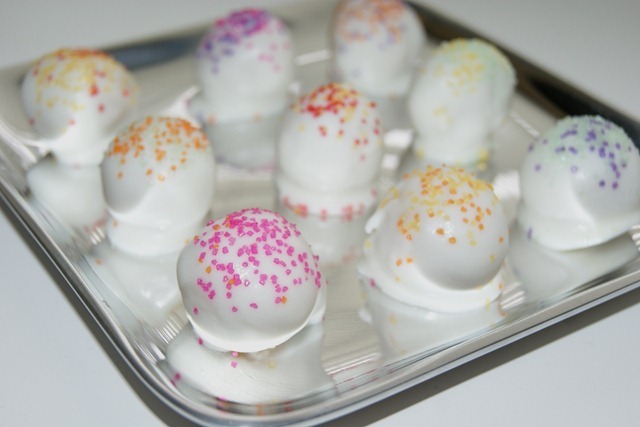 These little truffles look perfect for Easter!! 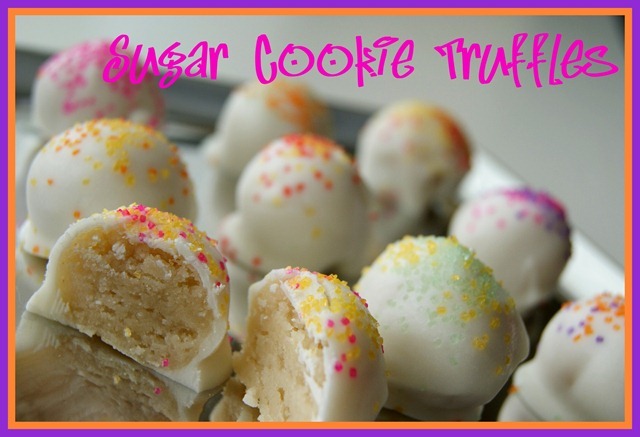 I’m not a big sugar cookie person, but I’m sure I’d love these! I love grocery store sugar cookies with the impossibly thick layer of frosting. 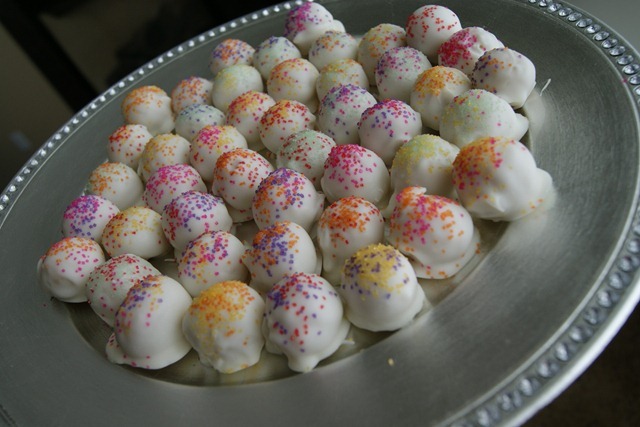 Your truffles turned out beautifully- I love the decorations and was thinking these would be perfect for a bridal or baby shower. Definitely adding this to my bookmarks! These are adorable!!! And easy!!! So cute for spring. I will be making these. Thanks Doll! Hey! Just wanted to let you know that you won my VITALICIOUS Giveaway-please email your address to healthykrit@gmail.com Thanks! Oh man! I have not seen you cook anything lately that I haven’t drooled over – and this is no exception. Looks so delicious and I love the pairing of the sugar cookie with the white chocolate. Girl, you are killing me with these!!!! Oh my gooosh. These are so cute, it would probably be dangerous to make them as I might eat every.single.one. I love my sugar cookies soft. Awesome. I won’t be able to eat real food for another week or so, but I can plan for the future! 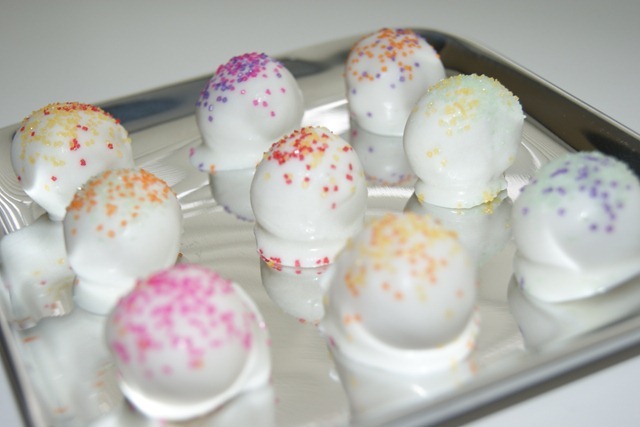 I added these to my “recipes to try” page! I love soft sugar cookies. 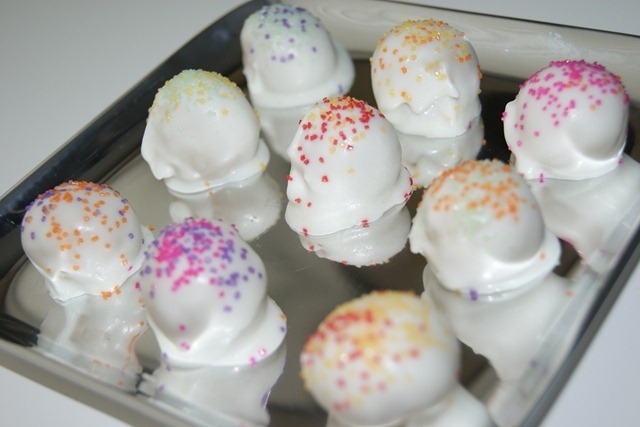 Your truffles looks delish -I can 0nly imagine how good they taste! Oh lady… I love truffles and cake bites. This is just awesome! I made these they r so so GOOD! im making them for a bridal shower and going to put them in little boxs for the favors! But how long in advance can I make these? How long in advance can I make these? how many days do they last? I would say 3-4 days is all you should make these in advance. They last for about a week if kept refrigerated. Cute idea you have! Have fun with it! It all depends on what size you make them. The size I did mine, made about 45-50 of them.